Found in abundance on acid peat on raised and blanket bogs. 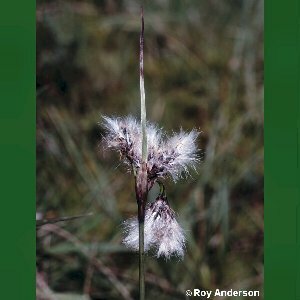 The plant is fairly inconspicuous in flower, but in fruit it produced plumes of white cotton-like hairs which give the plant its common name. 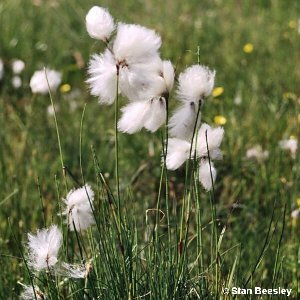 There are two or more fruiting heads per plant, which distinguishes it from the other common species, the Hare's-tail cottongrass (Eriophorum vaginatum). 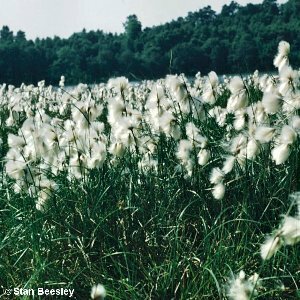 All names: Eriophorum angustifolium Honck. ; Eriophorum polystachion L.nom.ambig.